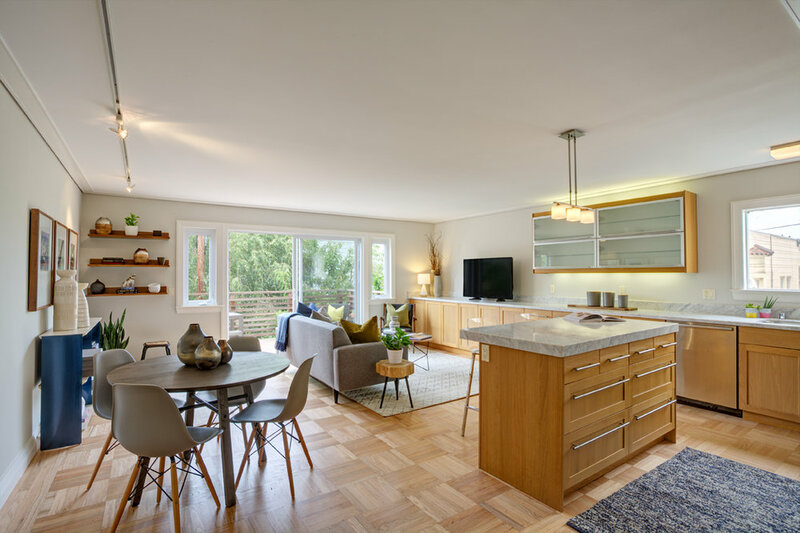 Resting on a flat block in Cow Hollow, 2828 Greenwich St #4 is ideally located within steps of the Presidio and a short walk to the commercial corridors along Chestnut St and Union St. The residence was completely renovated throughout in 2008 and features a desirable open floor plan and contemporary design. 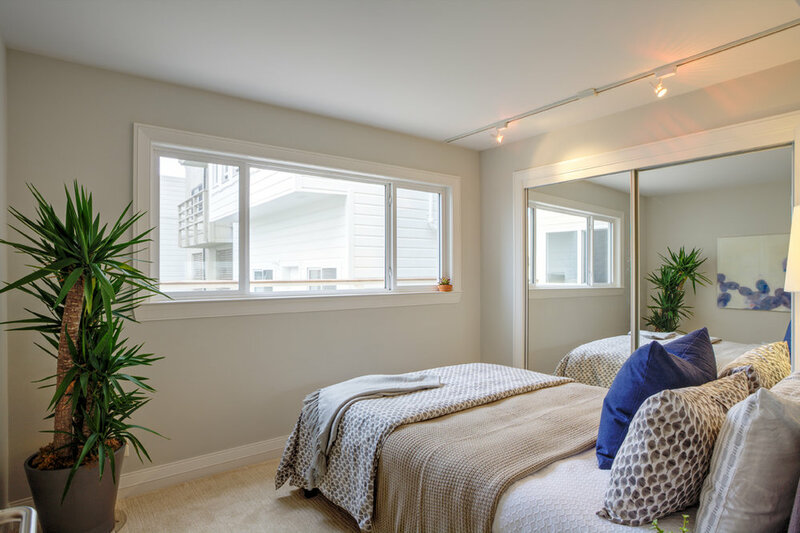 Located on the first floor of a boutique eight-unit building, unit #4 is perfectly positioned in the rear and enjoys morning light along the eastern windows. The home is appointed with 2 bedrooms, 1 bath, a large exclusive deck, 1 car parking, and additional storage. The living and dining spaces are located in the great room, which provides direct access out to the large private deck, ideal for indoor and outdoor entertaining. The kitchen enjoys white carrera marble counters, honey-colored cabinetry, an island, an office nook, and great storage. The bedrooms and full bath are located down the hall and offer ample storage space. There is in-unit laundry across from the master suite. Details include refinished oak hardwood floors, fresh paint, and an open floorplan with direct access out to the exclusive deck. The residence includes 1 car parking in the garage and private storage. 2828 Greenwich is an intimate 8-unit building with an incredible common area roof deck. The roof deck enjoys Alcatraz/Bay views and is the ideal retreat for BBQs and every day relaxation. 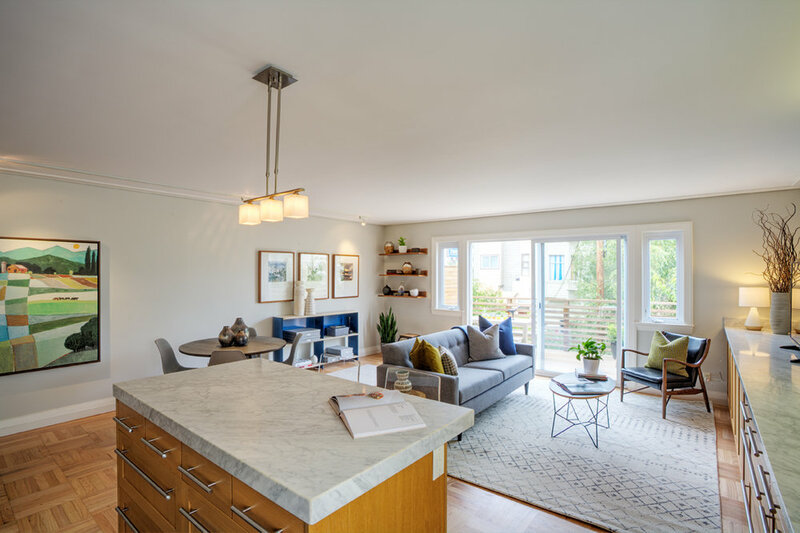 Located along on the western edge of Cow Hollow, 2828 Greenwich St is ideally located within steps of the Presidio and a short walk to the commercial corridors along Chestnut St and Union St. Favorite destinations include the Lyon Street Steps, the Palace of Fine Arts, Chrissy Field, and the the Cow Hollow Playground on Miley St.